Microsoft on Tuesday unveiled a low-cost version of its Surface tablet computer, cutting the screen size of the device which starts at $499. The Microsoft Surface 3 will cost less than the $799 starting price for the Surface Pro 3introduced last year, but will also have a less powerful processor and lack some other features. The tablet is also being called the thinnest and lightest Surface ever, weighing 622 grams and sporting a 8.7mm thickness. The new Microsoft tablet comes with a 10.8-inch full-HD display, making it smaller than the earlier 12-inch screen versions of Surface, and gives Microsoft a new tablet that aims to compete with Apple’s iPad Air. The firm will also be launching a Microsoft Surface 3 (4G LTE) variant. Both run Windows 8.1, with a free upgrade to Windows 10. Two built-in storage models will be available, with the 64GB model featuring 2GB of RAM, and the 128GB model featuring 4GB of RAM. “Surface 3 brings what customers love about Surface Pro 3 to more people, delivering the premium design and productivity of Surface in a more affordable device,” saidPanos Panay, who heads the Surface division for Microsoft. 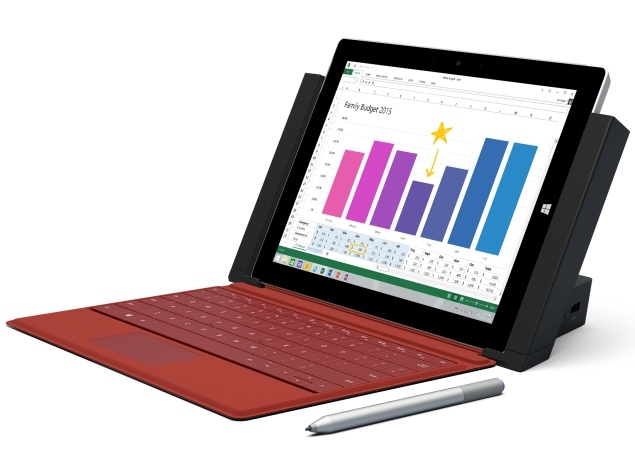 The Surface 3 features a full-size USB 3.0 port, a Mini DisplayPort and a microSD card reader. The Surface 3 will have an optional dock with four USB ports, Ethernet jack, and a Mini DisplayPort. Microsoft touts the Surface as a tablet that can replace a laptop. Also new is the Surface 3 Type Cover. The Surface 3 will also include a free one-year subscription to Office 365 Personal, including full versions of Word, Excel, PowerPoint, Outlook and OneNote as well as 1TB of OneDrive storage. It also supports the Surface Pen. Pre-order is available starting Tuesday in the US through Microsoft Stores, microsoftstore.com and select retailers, and it will be on sale beginning May 5, with availability in 26 markets by May 7. With sales topping $1 billion for the first time in the last quarter of 2014, analysts said the tablet appeared to be swinging to profitability.